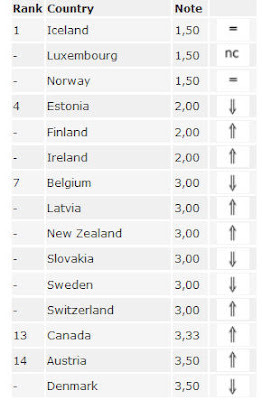 criteria that assess the state of press freedom in each country. It includes every kind of violation directly affecting journalists (such as murders, imprisonment, physical attacks and threats) and news media (censorship, confiscation of newspaper issues, searches and harassment). Ánd it includes the degree of impunity enjoyed by those responsible for these press freedom violations. It also measures the level of self-censorship in each country and the ability of the media to investigate and criticise. Financial pressure, which is increasingly common, is also assessed and incorporated into the final score. The questionnaire takes account of the legal framework for the media (including penalties for press offences, the existence of a state monopoly for certain kinds of media and how the media are regulated) and the level of independence of the public media. It also reflects violations of the free flow of information on the Internet. Reporters Without Borders has taken account not only of abuses attributable to the state, but also those by armed militias, clandestine organisations and pressure groups. The questionnaire was sent to Reporters Without Borders’ partner organisations (18 freedom of expression groups in all five continents), to its network of 130 correspondents around the world, and to journalists, researchers, jurists and human rights activists. A scale devised by the organisation was then used to give a countryscore to each questionnaire. 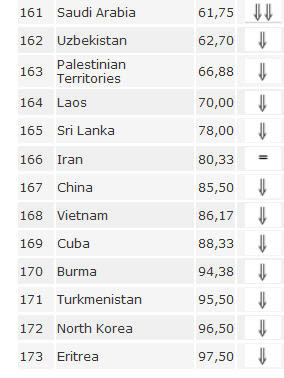 The 173 countries ranked are those for which Reporters Without Borders received completed questionnaires from a number of independent sources. Some countries were not included because of a lack of reliable, confirmed data. Where countries tied, they are listed in alphabetical order. The index should in no way be taken as an indication of the quality of the press in the countries concerned."